DxO Labs* has released its thorough report on the Samsung Galaxy S5 camera and the results are looking great for Samsung. The Galaxy S5 comes with a 16MP camera with a BSI CMOS sensor, packed with a F2.2 maximum aperture and 4K video recording. The camera however lacks an optical image stabilization system. The DxOMark report is based on a series of tests which take into consideration noise, autofocus, artifacts, color, exposure, texture acutance, the flash and more. The Samsung Galaxy flagship scored an excellent rating, with 79 points, which ties it with the Sony Xperia Z2 as the best cellphone camera they’ve tested. DXO praises the GS5’s “reliable auto-exposure even in difficult outdoor lighting” and its “fast and accurate autofocus in trigger mode.” The camera was also highly rated for excellent color, and low noise in low light photos at the expense of some detail. While still pictures lose some sharpness in the corners, they retain “a high level of detail” in the middle of the frame . And while DxO praised the camera’s low noise in dim light, they did note that low noise comes at the expense of loss of detail. DxO says the GS5 produces the best video from a cell phone they’ve ever tested. 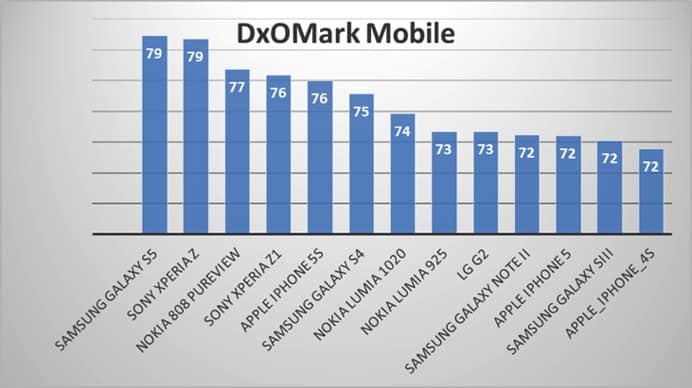 For the full report you can visit the DxOMark Mobile report. *DxO Labs is a manufacturer of software, DxOMark, which is widely used to test the performance of cameras and optics, from cell phones to professional cameras costing many thousands of dollars. DxOMark consists of a comprehensive image quality database and a set of tools and a coring system which can be used to evaluate and compare digital cameras and lenses.